Johnny had been with Albion Rovers, Motherwell and St Johnstone before he signed for United. He joined the Club as it entered a second season in Division One and became a regular in the side. 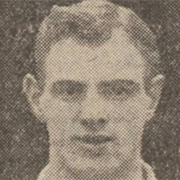 United were relegated in April 1927 but Johnny remained at United and helped gain promotion again in season 1928-29. The First Division campaign of 1929-30 ended in relegation again and Johnny was released, going to Ross County as player/coach. He applied, unsuccessfully, for the vacant Manager’s job in May 1931 but was appointed trainer in July 1932. He left five years later but was back again in 1946 in the same role. After another seven years with the Club he gave up his coaching position but carried on as a scout for several more years.